This gorgeous mod will allow you to keep a weapon in Minecraft PE in two hands. With two hands you can beat any of the enemies twice faster than with a single weapon in one hand. If both hands to put the tools you will be able to twice as fast as digging or extract resources. Thanks to mode can be even put in one hand weapon, and in the other hand righting life potion. Modes on the two arms is suitable for all versions of MCPE since 0.10.0 and above. 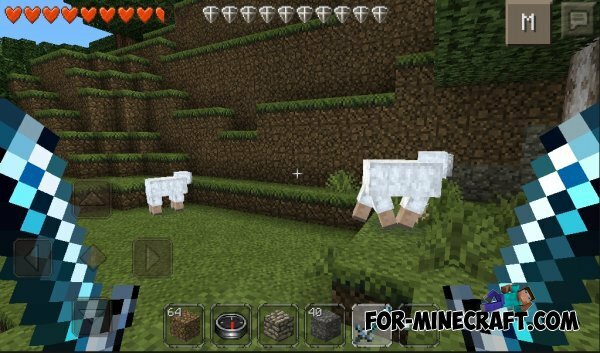 Too Many Items mod for Minecraft PE 0.10.4Too Many Items Mod for Minecraft PE 0.10.4 - an updated version of the mod for MCPE 0.10.4 .